The guitar industry is mostly dominated by a small group of classic body styles and electronic appointments. Sometimes, it can be difficult to find a guitar that offers more than the traditional components without paying top dollar. 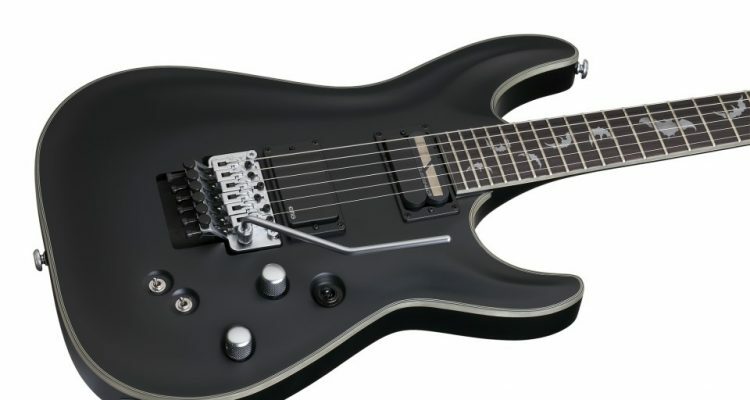 Today, we’ll be reviewing the Schecter Damien Platinum-6 FR S, a guitar that aims to break this trend by offering a ton of innovative features at $839. Cool features aren’t everything though, so let’s see how it fares! The dense 3-piece maple neck offers some extra snap for a neck-thru configuration while also providing excellent stability. The thin “C” profile found on many modern Schecter guitars makes for a fairly thin, shred friendly neck. Although not as thin as an Ibanez Wizard profile, the extra thin neck design is a welcome change from the older, fatter Schecter necks. The bridge is a Floyd Rose Special, which is essentially a bridge based off of the Original Floyd Rose, except it’s built in Korea as a more affordable option. Unlike the C-1, which is an all mahogany instrument, the Damien Platinum comes as a mahogany body paired with a maple neck. This classic wood combination delivers a balanced warmth with a bit of focus in the lower mid range. The wood choice, paired with the infamous active EMG 81, makes for an aggressive and thick tone for metal players. 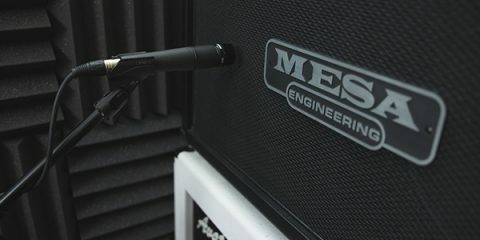 The EMG 81 is (somewhat unfairly) bashed for being overly compressed and dull. 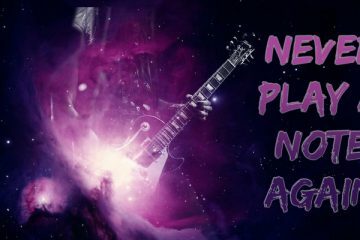 By no means are they the best pickups out there, but the truth is, you can definitely pull some sweet metal tones with a tight response from these…. We go over this some more in our article, Are EMGs terrible? The absolute coolest part about this guitar is the Sustainiac. With the simple flip of a switch, Schecter’s proprietary design offers up the ability to literally ring out forever. 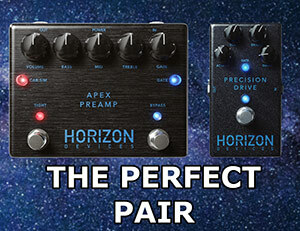 The 3-Way switch allows you to change between different modes called fundamental, harmonic, and mixed. Pairing a Floyd Rose with the Sustainiac creates a guitar with tons of versatility for different effects. While the guitar’s Sustainiac allows you to make some really neat ambient sounds, the pickups themselves are underwhelming for funky and bluesy tones. You won’t really be able to get a nice, snappy strat sound out of it. In terms of tonal versatility, it falls a bit short. Schecter has had an interesting journey. Starting off as a custom shop building parts, they transitioned to a mediocre factory-built guitar company. The quality wasn’t bad at all, but it wasn’t really anything to write home about. 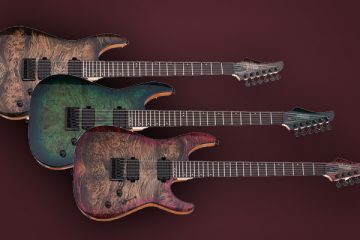 After they brought back the USA Custom Shop in 2013, they really turned it around and are building some really high quality instruments. 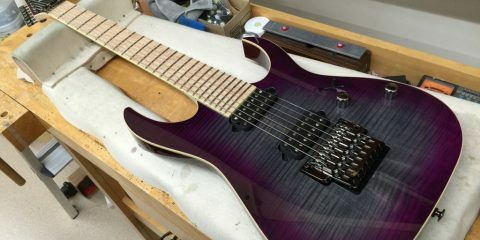 The Damien Platinum is a Korean-built guitar, so it doesn’t have the same quality control as the Schecter USA Custom Shop. There were a few small things to point out, but nothing that affects playability too much. The finish was applied well with very few imperfections, although it feels a bit thin and easily scratched. There is slight overspray onto the edge of the fretboard/binding, but almost completely unnoticeable unless specifically looking for it. The fret work was actually done quite well and there were no dinged frets to be found. The action was set quite low out of the box with lots of string buzz, but it wasn’t a problem when played through an amp. The Floyd Rose Special is decent. It’s not as stable as the Original Floyd Rose, but the FR locking nut definitely helps hold the tuning. The Damien Platinum is a fairly affordable guitar loaded with features that is aimed at a metal guitarist on a budget. 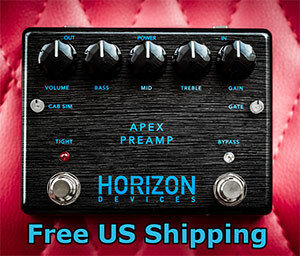 Its has a unique look and offers up a ton of cool sounds, thanks to the Sustainiac. This isn’t the best choice for playing clean or crunchy tones, but the tight sound from the EMGs, coupled with the Sustainiac, makes for a great choice for a studio metal guitar. We upload new articles daily so if you liked this one, make sure to check out some more! We are also authorized Schecter dealers and can get you any current Schecter you’d like at the best price possible.